A black and white photo looking down Albion Street, Hull Royal Infirmary. 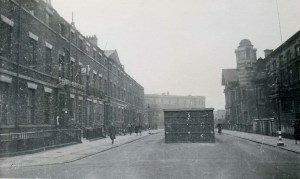 In the middle of the street is a square brick building which is an air raid shelter. A few people are walking down the left of the picture along the street. The time is before 8 O’Clock in the morning.